The degree of danger in the atmosphere of a hazardous location needs to be determined prior to selecting an acceptable electrical equipment installation. If maximum safety is the predominant factor in determining the type of electrical installations, the cost of electrical equipment will be extremely high. If low cost of electrical installation is the predominant factor, safety to personnel and equipment may be unacceptably low. It is, therefore, necessary to find a point of balance at which the cost and safety requirements are both satisfied and acceptable. In nine out of ten cases, a hazardous location is classified much too conservatively. The reason for this conservative approach is a lack of knowledge and a misunderstanding of the actual concept of safety and danger. 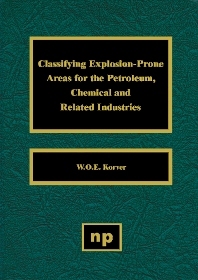 This book provides an in-depth understanding of the factors that influence the classification of a hazardous location. One factor, in combination with one or more other factors, will have an impact on the level of danger and its hazardous boundaries. These factors and their influences are explained in detail, and once their impact is understood, the classification of a hazardous location becomes a straightforward procedure.